There’s some stark contrast between the two latest releases to come from The Grifter Brewing Company. It’s not quite black and white, however, rather black and blonde. 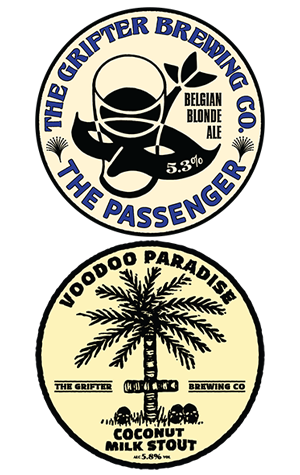 The first is a Belgian style blonde ale called The Passenger. When you get it on tap it’s cool. Probably a little too cold, actually, to the point where it seemed to not have a lot going for it. But give it a few minutes for the chill to wear off and The Passenger begins opening up to reveal its true form, much like a hitchhiker you stop to pick up with a looming sense of dread but who ends up being full of warmth and character and excellent company on your trip. This passenger is a fairly simple but elegant wee ale, starting with some spicy and slightly stuffy aromas of the Belgian yeast, which show their stuff without being dominant. In the mouth it moves into maltier territory (all NSW Voyager grain in this one) which is slightly chewy and sweet and topped off with subtle hints of cardamom and clove. In a world gone mad for hoppy pale ales, something like this that’s similarly pale and sits in the same approximately 5 percent ABV range, but whose focus is on the other ingredients, is a welcome change. Voodoo Paradise is a beer that’s been out at the brewery before, once and fleetingly, but there was enough then to suggest it would be something whose return was almost inevitable. It’s a coconut milk stout with lactose that’s served on nitro, a descriptive menu likely to attract as many people as it keeps at arm's length. Those that dive in will be rewarded with a beer somewhat reminiscent of a rich chocolate milkshake, all velvety and creamy in texture and lush with flavour. The chocolate character comes on strong with a faint touch of roast and a supple smothering of lactose sweetness that possibly diminishes the coconut character a little. Being served on nitro really takes the beer up a level, making it feel fuller and disturbingly moreish. Fair warning: if you like sweet stouts, Voodoo Paradise may put a spell on you.